The Reason devices you'll need to set up the arpeggiator effect. I hope Propellerhead add some form of arpeggiator device to Reason when they next release an update. Users certainly expend a lot of energy on trying to recreate the effect in Reason, and indeed we've examined pseudo-arpeggiator effects before in this column. But here's something I've been meaning to work out for a while that might be of interest to some of you. The star of this technique is the Malström and its sophisticated modulators. So, first, add one to the rack, but don't bother connecting its audio to the mixer. Also add a Subtractor, load a patch suitable to be arpeggiated (at random, I loaded 'Acid Square 2' from the Monosynths folder in the Factory Sound Bank), and then add a Matrix pattern sequencer, linked to the Sub. Flip to the rear panel, and route the Malström 's Mod A CV output to the Sub 's Pitch modulation CV input. 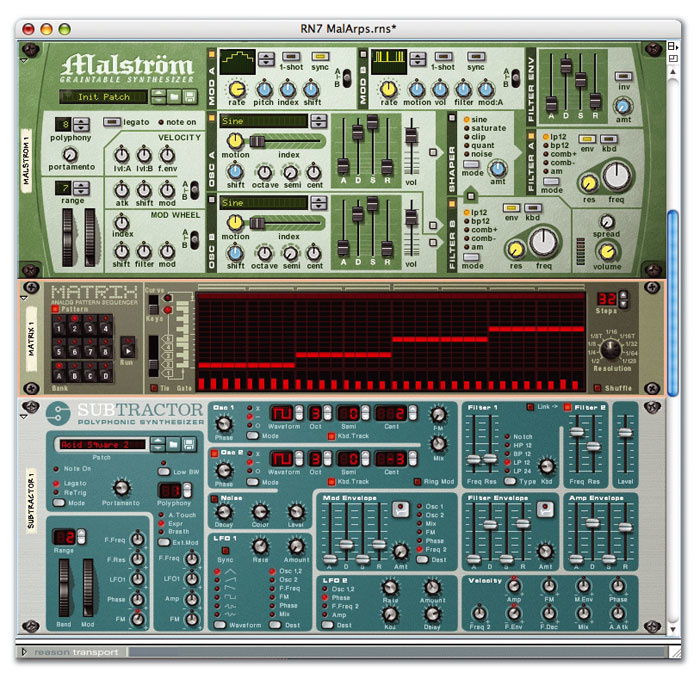 Back at the front panel, disable Mod A on the Malström and program a simple repeating note pattern on the Matrix. I set the pattern length to 32 steps, switched the note range to octave 2 and drew in a row of bottom Cs, with a trigger for each step in the lower gate strip. Returning to the Malström, re-enable Mod A, engage the Sync button and select modulation curve 23. If you play back the Matrix pattern now, you'll get a repeating pattern of notes, spread over a wide pitch range. We're now going to tame that, although it might be an effect that you'll want to remember for later! First, set the Mod A rate knob to 1/8 (the Matrix still has a step resolution of 1/16), then go to the rear panel again. Turn the Subtractor 's oscillator-pitch modulation-input trim control fully left; the repeating C-notes return. But move it one step to the right and you'll start hearing pitch changes again, albeit of a fractional nature. (You might have to adjust your mouse response here, under General Preferences, to be able to easily increment parameters a step at a time. My Mouse Knob Range is set to Very Precise.) The first usable trim value is three. If the root note playing Subtractor is C, a repeating pattern made up of C, C-sharp, D, D-sharp and back down again is produced. The next useful value is six, offering C, D, E, F-sharp. Other good trim values include: nine (C, E-flat, F-sharp, A); 10 (C, E-flat, G, B-flat); 11 (C, E, G, B); 12 (C, E, A-flat C); 13 (C, E, A, C-sharp); and 21 (C, G, D, A). Several of these might be a bit atonal or offer a rather whole-tone feel, but experiment. Some of the trim values I haven't mentioned nearly work — for example, five nearly produces C, D, E-flat, F, and seven nearly produces C, D, F, G. Some of the intervals produced, especially using trim parameter values not quoted, aren't exactly even-tempered — and many are downright cranky! But when the main examples are going fast, no-one will notice. Besides, the 'bad' notes in the good examples are only a few cents off with regard to equal temperament. If anything, you'll simply get a little extra texture when these are bubbling in the background. Let's now change our repeating C-note pattern into more of a riff. The pictured example shows a simple ascending note run with eight steps each for C, D, F and G. The result isn't, of course, a real arpeggiation, though the insistent 16-note feel is similar: we're not breaking up a chord in any way, and without a little forethought the notes produced will be rather unpredictable. However, even the unpredictability can be a good thing, turning this Reason rack into more of an algorithmic composition tool. More complexity can be produced by manipulating the step resolution of the Matrix and the Malström mod, plus the amp envelope release on the attached Subtractor. Slow things down so that the up/down pattern doesn't finish before a Matrix note changes, which would happen with a Matrix step resolution of 1/4 and a Malström mod rate of 4/4, and new, unexpected patterns emerge. Play with Matrix pattern lengths and vary the pattern of note-on events (not to mention note pitches) too. You can also experiment with the other stepped modulator curves on the Malström. Options 21-27 produce similarly predictable results, but I haven't got the space here to tabulate the notes produced. And don't forget that NN19 has an oscillator-pitch modulation input that functions in just the same way as Subtractor 's. I tend to save two- or four-bar sections of the audio produced by this fake arpeggio technique, treat them in Recycle and use the result to add extra textures to existing tracks, or even start off entirely new tracks. You might be wondering why we're using NN19 for this technique, rather than the more sophisticated NNXT. Well, it's because NNXT doesn't offer such direct access to its Sample Start parameter. However, velocity can be assigned to Sample Start in NNXT as a substitute for the technique described above: in the Velocity section of the front panel, turn the 'S Start' knob fully right. Load a sample, insert as many 64th-note 'C's as you need, then view the velocity track in the sequencer Edit View and use the line tool to draw a straight velocity curve from the lower corner of the display to the top, ending at the right loop marker. When you play back, the result is the same. Making this assignment will compromise any other, more standard velocity assignment (such as velocity to amplitude) you may wish to use, but aside from that it's a valid alternative, if you prefer to use NNXT. Though not as quick or flexible as a genuine timestretching tool, this technique can be expanded upon. Use a coarser resolution, such as 16th or quarter notes, to create a more choppy effect. Erase some notes in the stream while leaving the controller curve intact. And if you use the velocity-to-sample start option (also achievable in NN19), it'll be possible to use the Change Events process (under the Edit menu) to 'Alter Notes'. This rearranges the notes according to a percentage weighting, normally creating new musical material. In this case it will simply rearrange loads of 'C's, but the rearranged velocity levels mean that whatever sample is loaded into the NN19 or NNXT will be played back in an eccentric manner, often generating strange or disturbing sound clusters, especially when 'stretching' speech. Playing with the amp envelope — start and release times especially — can also affect the end result, often eliminating clicks and making rearranged speech almost make sense! I'd like now to share with you a technique that's been described as 'timestretching'. I can't take credit for it, and although it's not really timestretching, it's still interesting. If you hunt around on Reasonstation (www.reasonstation.net), you'll find more discussions on the topic, plus a number of example songs, and there's also a discussion at the Reason users' community on LiveJournal (www.livejournal.com/ community/reason_users/). While the effect produced is sonically similar to a not-very-sophisticated timestretch algorithm slicing up a sample really slowly, you don't have much control over it. However, it's still fun and may remind you of a granular synth effect. 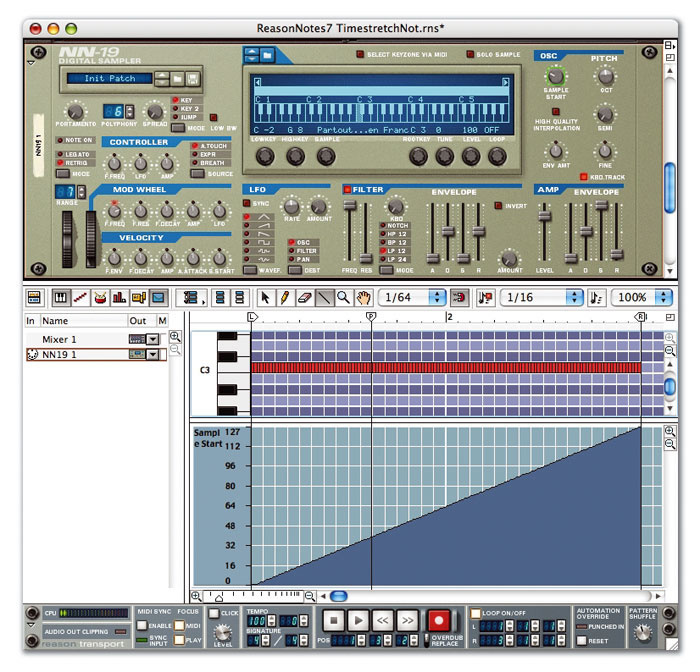 The technique starts with an NN19 sample player. Load a sample, which would ideally be, for a first test, some speech. (Try anything you like later!) In the sequencer Edit View, draw lots of consecutive 64th notes at C3, the default note that triggers new samples loaded into NN19. This sounds like an irritating, finicky job, and it is. Reason 's maximum on-screen resolution is 32nd notes, so even though the Snap value can be set to 1/64, you don't have a grid to work to. No problem: still enable the Snap to Grid button (the magnet in the sequencer toolbar), and set Snap value to 1/64 (with the pop-up to the left of the button). Use the pencil tool to draw in one note at the beginning of the first bar. Highlight it, copy it (using Apple/Control + C), and paste it as many times as needed (Apple/Control + V). This key combination pastes the copied note immediately after the previous one; hold down the keys and the notes will appear automatically. Let go when there's enough. But how many is enough? I tried a number of options here, but if you've got a short-ish sample it works to set your left loop marker to the start of the song and the right to the start of bar five and ensure that you fill the space with 64th-note 'C's. In the Edit view, enable the controller lane for the Sample Start parameter (Option/Alt-click NN19 's Sample Start parameter knob). Drag and zoom this lane so you can see it quite large, and select the Line Tool (the line icon between the eraser and magnifying glass). Click and hold at at the lower left of the display, and draw a line right up to the top of the display, finishing at the right loop point. Now hit play on the transport bar. You'll hear a granulated, stretched version of the sample lasting four bars. This really neat trick synchronises controller changes for Sample Start with note-on events. You can make them play out faster or slower by drawing the Sample Start curve for fewer or more bars (ensuring there are enough note-ons, of course). Unfortunately, the effect can't really be synchronised to a host track, so it's strictly a special effect — but one that really adds something to a track when used discreetly. The fake timestretching effect illustrated in Reason. Don't forget that the Spider Audio device's splitter circuit can just as easily split two mono signals independently as it can split a single stereo signal. When triggering sound effect or impressionistic samples in NN19, you don't even need your MIDI keyboard: Alt-clicking the little on-screen keyboard in NN19 (and NNXT) triggers them for you. Remember that you can 'Export Loop' — the section of song playing between the left and right locators — and that the loop can then be re-imported into NN19 or NNXT. If it has definite rhythm, the loop won't change tempo if you alter the song's tempo, but this can be a quick way of re-using any atmospheric or extremely effected material that you might create while noodling with the software. Here's a quick way to create bouncing stereo delays. Simply route the left and right jacks of a Remix aux send — which are in stereo since v2.5 — each to a separate DDL1 digital delay. Route a mono output from each DDL1 to the left and right connections of the aux's return. Bingo: no-pain stereo delays! Almost any pair of timed delay values (which can be selected with the DDL1 s set to 'Steps' mode) can produce an interesting effect. It's worth remembering that the reverse reverb algorithm available on the RV7000 reverb device doesn't 'fake it': the incoming audio is sampled and played back in reverse, leading in to the original audio played the right way round. Thus a true reverse reverb effect, with up to 4000ms reverb time, can be produced. However, you need to make sure that the sound being reversed starts early in your track, by the same amount of time that the reverse effect takes. This ensures that the orginal sound occurs at the desired point in time, an effect that's easier to achieve using the algorithm's tempo sync option.